It was seen that in the formation of the first Ministry he was willing to form an alliance with Congress. But it was due to Congress that such thing did not materialise. 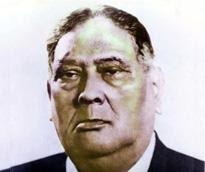 Huq was popularly known as Sher-e-Bangla or Huq-Saheb . During the first Ministry (1937-1941) Huq did some laudable workfor the amelioration of the sufferings of the poor peasants. He prtected the poor agriculturists from the clutches of the usurious creditorsby enforcing the Bengal Agricultural Debtors' Act (1938). He also set up the Debt Settlement Boards in all parts of Bengal. The Money Lenders' Act (1938)and the Bengal Tenancy (Amendment) Act, 1938, improved the lot of the peasants.The land Revenue Commission appointed by the Govt. of Bengal, on 5th Nov. 1938, with Sir Francis Flout as chairman, submitted the final report on 21 March 1940. This was the most valuable document related to the land system of the country. The tenancy act of 1885 was amended by the act 1938 and thereby enhancement of rent was suspended for 10 years. It also abolished all kinds of taxes imposed , time to time, by the Zamindars to its raiyats.The raiyats got the rights of transfer their land without paying any taxes to the Zamindars. The law also reduced the interest of the loan from 12.5 % to 6.25 %. Though Huq was not able to provide with Dal-Bhat to all as announced inhis election menifesto still he was able to give some relief to the peasants. Huq introduced reservation 0f 50% of govt. services to the Muslims and implemented it. He also introduced 15 % reservation for Schduled Castes. As education minister he acceleratedthe speed of Muslim education. He was associated with many institution and established Islamia College (Maulana Azad college) , Lady Brabourne College and Wazid Memorial high school in Calcutta and Chakkar College. The second ministrhy (1941-1943) he turned out essentially into a front against Muslim League and made the influence of the league from the minds of Bengali Muslims to a Minimum. From the 1942 Huq opposed the two nation theory and devoted his entire energy to reduce the influence of the Muslim League. During 1943 to 1946 he continuously opposed the League.